I love violets. Right now, my backyard is full. I have posted about violets before. Check this post out….violet ice cubes! The leaves and flowers are edible. 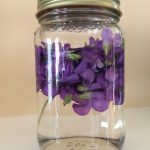 This spring I have tried a new recipe and I wanted to share it with you…..wild violet infused vinegar. First, gather a generous handful or two of violets. 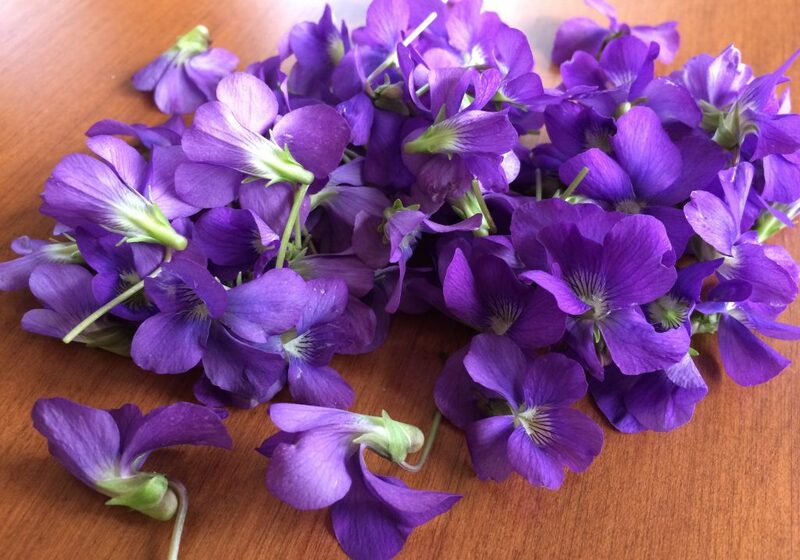 This is the fun part……foraging in your backyard for these delicate, purple beauties! Then, put them in a glass jar. Cover with a good quality white vinegar. 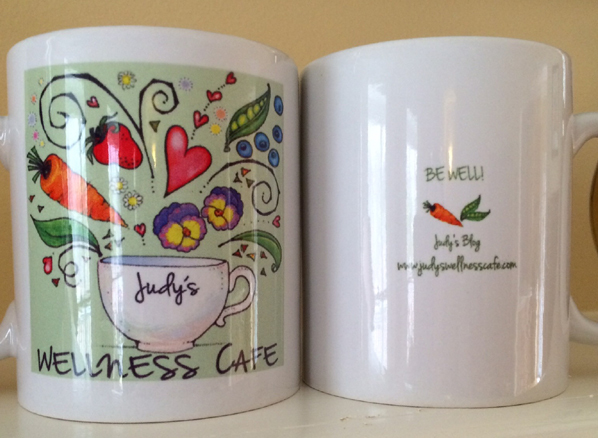 Put a lid on the jar and store in a cool and dry place for 2 weeks. After two weeks, drain. Voila! Store in the fridge. 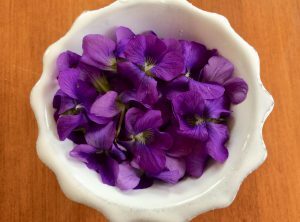 *A couple of notes…..when you pick your violets, make sure there have been no pesticides or herbicides applied to the area. You can rinse them if you want but it is not necessary. *If the lid to your jar is metal place a piece of saran wrap, parchment or wax paper between the jar and lid. Otherwise, the metal will corrode. 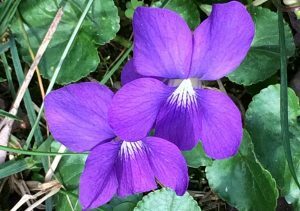 *After a few days, the violets will lose their color. No worries. The purple goodness is leaching out in to the vingar. Did you know violets are high in vitamin A and C? They are also high in fiber and full of anti-oxidants. 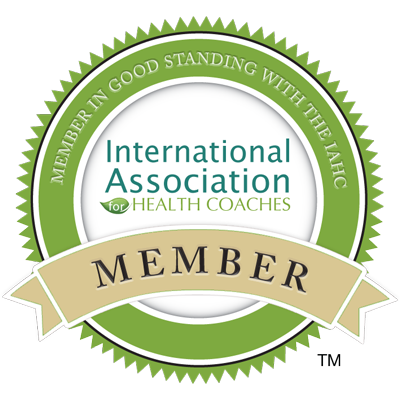 They are blood cleansing, soothing for skin issues, and are often used as a pulmonary remedy. They contain rutin which is a beneficial compound for varicose veins and hemorrhoids. Now! 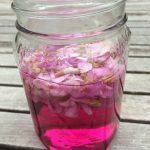 What to do with your beautifully purple violet vinegar? 💜use as a salad dressing with your favorite oil. Add a few blossoms to your salad for fun. Remember…they are edible! 💜add a spoonful to water and drink for some immune boosting. 💜add honey for an effective cough syrup. 💜add with Epsom salts for a relaxing bath. 💜it provides excellent relief for a wasp sting. Soak a cotton ball and apply. 💜use as a hair rinse. 💜it is very soothing for a sunburn. 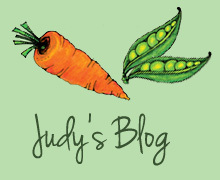 I hope you try this fun recipe! For all my northern family and friends….hold on a bit longer. The violets are coming! 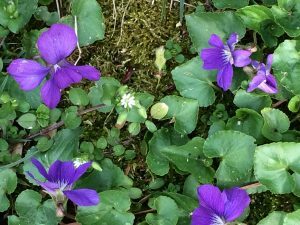 Violets are a sure sign of spring and a welcome shift from gray to green. This sounds interesting! I just may try it. I have lots of them in our yard. Let me know if you try it, Gail! Super easy. I love this reco. Thanks! Looking forward to violet vinegar with my spring greens!